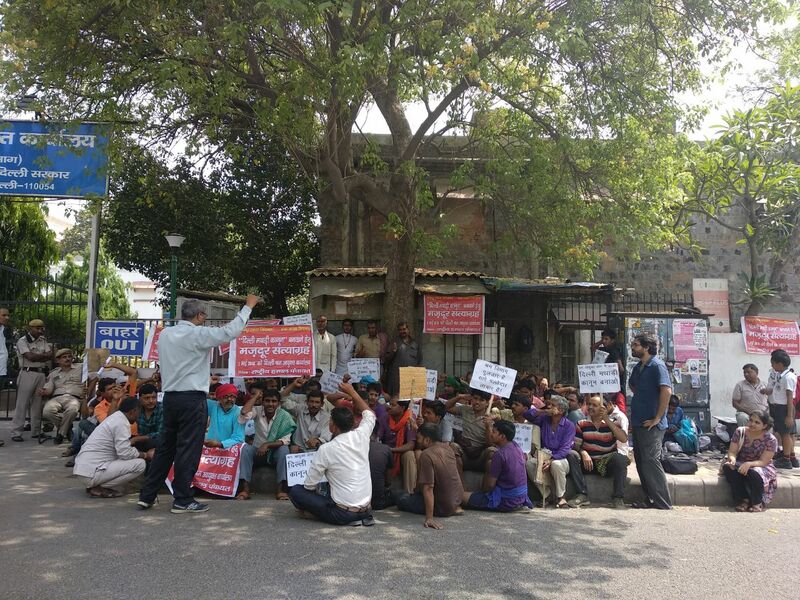 Forty years after the Azadpur wholesale vegetable and fruit market was created, thousands of loading workers demand the Mathadi Act to protect their rights. This May Day, palledars (loading workers) from the APMC Azadpur sabzi mandi marched to the office of the Labour Commissioner to demand the introduction of the Mathadi Act in Delhi. The satyagraha, led by the Rashtriya Hamal Panchayat (RHP), had around a hundred participants with one key demand: the introduction of a Mathadi Law in Delhi and in other states. The RHP is a national organisation that represents loading and unloading workers who work in a variety of industries, and most of the workers that they have organised in Delhi work at the Agri-Produce Market Committee (APMC) mandi in Azadpur. The mandi is Asia’s largest vegetable and fruit market, dealing in around 50-60 varieties of vegetables daily, with annual arrivals exceeding 1.5 million tonne. The palledars are informal labourers who carry loads by handcart, cycle, or on their heads and backs. Load carriers, who are also called hamals or mathadis in Maharashtra, work in mandis, dockyards, railways, and in other markets where large-scale loading and unloading of goods occurs. Their working conditions are extremely harsh — as daily wage labourers without fixed wages, they also have no set terms of work and often work over 12-16 hours a day with no access to basic amenities or social security. As Arvind Murthy, a labour organiser said, “naam Azaad[pur] hai, par mazdoor ghulaam hain” (the name of the mandi is ‘freedom’, but we remain slaves). At the protest, Prakash Kumar, general secretary of the RHP, displayed a photograph of Delhi chief minister Arvind Kejriwal accepting a copy of the Mathadi Act from Baba Adhav, a veteran socialist leader and founder of RHP, in 2015. The delegation had met him with a demand to bring in the law. The meeting was publicised widely and reported by the media, and on April 30 last year, Kejriwal met a delegation from the RHP and Baba Adhav for the second time. He promised them that within three months his government would introduce the Act. 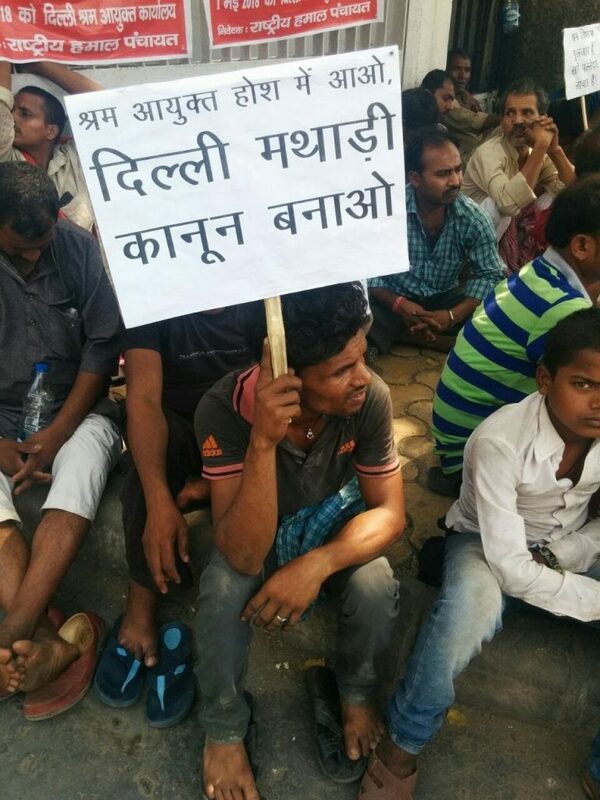 Bajrangi, one of the leaders at the protest said, “Kejriwal had come to our [Azadpur] mandi. In front of 5,000 sathis, he promised they would bring in the Mathadi Act. He had made us a promise, and we have come again with this demand, and will continue to do so until we have the Act in place”. The Maharashtra Mathadi, Hamal and other Manual Workers Act was enacted in 1969 (although implemented only in 1980), and has been identified as one of the earliest pieces of legislation to guarantee social security and regulation of working conditions for loading workers. A similar legislation was introduced in Tamil Nadu (Manual Workers Act 1982), Kerala (Headload Workers’ Act 1978) and Andhra Pradesh and Telangana, (Mutta, Jattu, Hamal And Other Manual Workers Act 1976). The Hamal movement has now shifted its focus to the status of workers in the national capital region, and has begun to campaign in other states. On International Labour Day (May 1) they submitted a petition to the Lieutenant Governor of Delhi, and met officials in the Labour Commissioner’s Office to discuss their demand. The Mathadi Act mandates the creation of a Mathadi Board to safeguard the interests of unprotected manual workers. The board has representatives from the employers, workers, and the state, and is responsible for the implementation of the Act and schemes created under it. In Maharashtra, each district has its own Mathadi Board, responsible for regulating employment, disbursing salaries, and ensuring social protection, as guaranteed under the Act. Employers as well as workers must register with the board as per the Act. The board charges a levy to traders, which goes towards welfare measures for workers. Salaries are thus no longer paid as daily wages directly to workers in cash, but disbursed to them through their bank accounts on a monthly basis, with provident fund contributions from employers. Activists claim that this is a ‘best practice’ model — it requires little financial contribution from the government, and the board can pay compensation in cases of accidents and injuries, protecting employers from the Workmen’s Compensation Act 1923. In the absence of any regulatory framework, workers continue to toil in inhuman conditions, lifting loads of 90-100 kilos at the Azadpur sabzi mandi, as vegetables continue to be often delivered by the quintal (100 kg). Those present at the meeting, both young and old, had stories to tell about being bruised by the excessively heavy loads they have to carry. Bajrangi said that loads of gheeya/tori (ridge gourd and bottle gourd) continue to come in three quintal loads, while Prakash added that carrots and spinach come in loads of 120 and 100 kilos. The International Labour Organisation (ILO) in 1967 recommended that an adult male worker should not carry more than a 55 kg load. One of the demands presented to the Labour Commissioner on May 1 was, therefore, to standardise the weight and size of loads, and outlaw the practice of 100 kilo loads. Hailing from Gonda in Eastern Uttar Pradesh, 29-year-old Vinod has been working at the Azadpur mandi for the last 13 years. He recounted the painful blistering of his back due to carrying heavy loads. With no healthcare at hand, he said his recourse was to dull the pain by carrying even heavier loads that would crush the blisters. His back bears the scars of those times. Other key issues raised at the meeting included the lack of basic amenities, long working hours, and no formal identity cards for workers at the mandi. Nitin Pawar of the Hamal Panchayat, said: “We work for 24 hours. Even animals have facilities; provision for water, and we are men! Labour rights are a faraway question; here we do not even have basic amenities”. Since none of the palledars are issued licenses and badges (APMC bylaws dictate that each palledar be issued a ‘G’ category license and badge), there is complete lack of formal recognition of their existence as workers at the mandi. In case of deaths, workers bodies are simply declared ‘unidentified’. Belonging mostly to lower caste groups, almost all the workers are migrants from Uttar Pradesh and Bihar who came to Azadpur in search of work. Lack of dignity was also pointed out by workers as an everyday issue at their workplace. One of the workers summed it up saying, “Mandi ki zubaan hi gaali hai” (Abuse is the language of the mandi). More recently, the labour ministry recommended implementing the Act in other states. However, even if passed, the Act is faced with significant challenges in terms of implementation. Upholding the spirit of the Act in terms of welfare and social justice measures will require strong collectivisation of workers, commitment on the part of unions towards worker welfare, and robust functioning of boards. In Azadpur mandi, the Hamal union currently has 2,000 formal members, although they claim that many more are affiliated. The number of palledars in Delhi, employed in wholesale markets like Chandni Chowk, railway goods sheds and various produce markets across the NCR, is estimated to be over 5,00,000. The presence of multiple party unions, who often work hand-in-glove with contractors, reportedly makes the collectivisation of palledars difficult. Fifty years on, the Mathadi Act has transformed the lives of hamals in Pune, who believe that due to this Act and the work of Baba Adhav and the Hamal Panchayat, they are now able to live lives of dignity and security. In Pune, the Hamal Panchayat has worked towards creating schools, a dispensary, a cooperative bank, and housing for hamals, and has even constructed a wedding hall. The RHP hopes that bringing in the Act could be the first step towards dignity of labour and social security for headloaders in Delhi as well. Officials at the Labour Commissioner’s office promised a meeting next week, to discuss a circular which would end the practice of loads exceeding 50 kg, and the demand for bringing in the Mathadi Act. Having lost a day’s earnings to protest in the heat on May 1, before they left for Azadpur, the by now hungry and tired palledars resolved to return in greater numbers, demanding the Mathadi Act and reaffirming their resolve to continue to struggle for better days. Radhika M Chakraborty, Shruti Iyer and Usman Jawed are researchers working at the Centre for Equity Studies, an autonomous institution engaged in research and advocacy on issues of social justice.